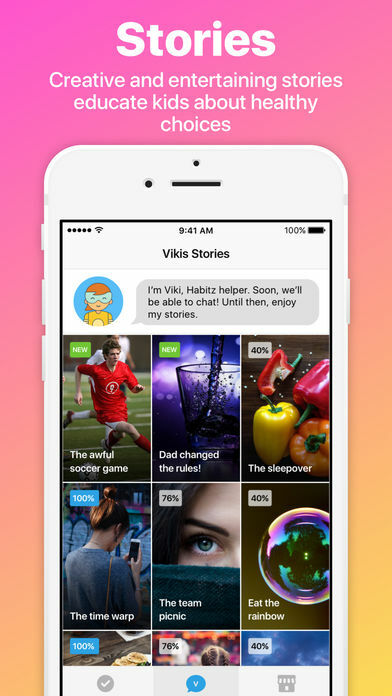 Habitz is a fun-to-use app that empowers kids to develop healthy habits and stick with them for life. 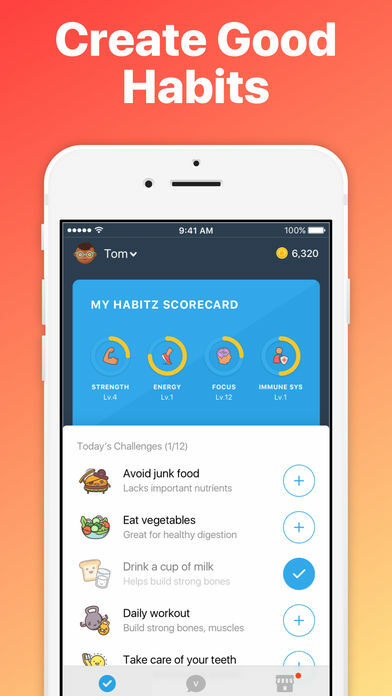 If you’ve ever struggled to get your child to make healthy choices, Habitz is the life-changing app you’ve been waiting for. Help your child make good choices that will help them as they become teenagers and eventually adults! Your child will carry the healthy habits they learn from Habitz throughout their entire lives! 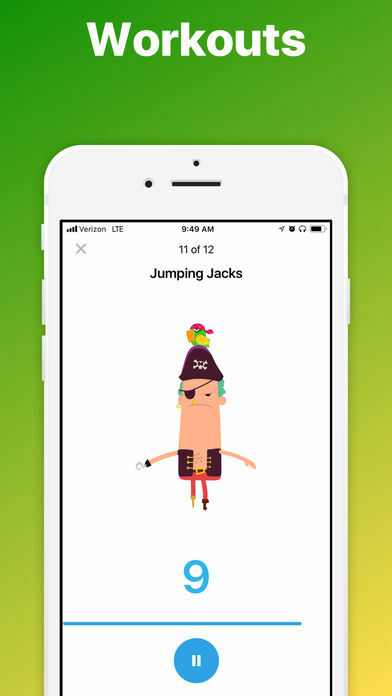 Habitz is a fun-to-use app that empowers kids to develop healthy habits and stick with them for life! Kids can be picky eaters, junk food lovers, spend too much time online, sleep-in too late, and not help with chores. With Habitz, your child can reduce or eliminate all of these behaviors with positive reinforcement! Habitz uses the knowledge, research and methods of leading pediatric dietitians, sports coaches and behavioral psychologists to provide parents with a critical tool to help their children lead healthier lives. Help your kids learn healthy habits today with Habitz! - Parents can also set fun and personalized goals to make healthy choices & get rewarded for hitting those goals. 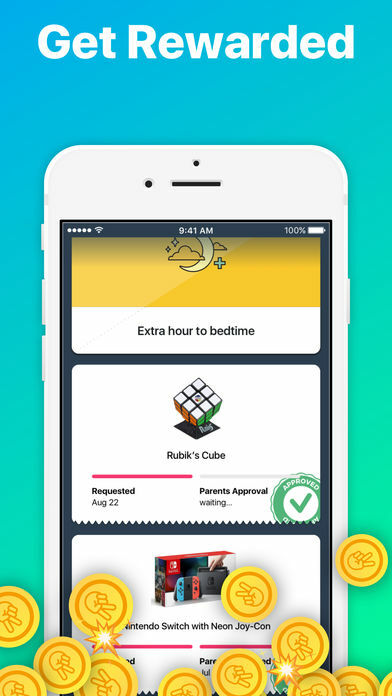 - Kids complete and track their goals within the app. - Kids interact with Viki (our automated health and lifestyle coach) via fun and educational stories. - They will learn why the choices they’re asked to make are smart and healthy. - Kids will then earn rewards as they complete their goals, encouraging them to continue making the right choices on a daily basis. - Rewards are selected by kids from our curated Habitz Store, and then approved and paid for by parents. - Parents can also designate non-monetary rewards to be given to their kids after achieving a goal. - With Habitz, you set your child’s goals for making healthier choices. - Learn healthy habits from Viki, the automated lifestyle coach. - Kids will be learning how to live healthier by having fun! - Studies show that kids who develop healthy habits early are less likely to develop health and behavioral problems later in life. - Studies show that rewarded habits become long-term habits. 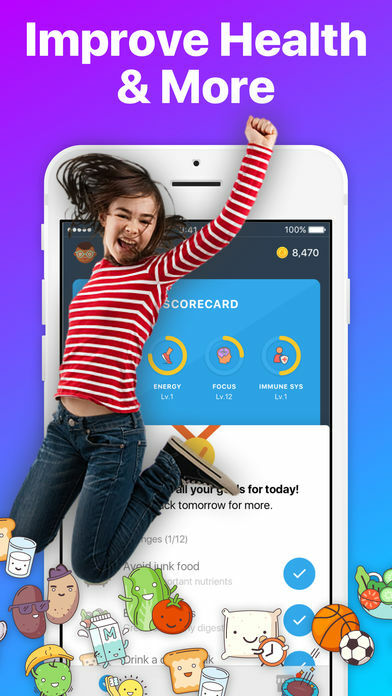 - As kids complete their goals, they earn Coinz that can be traded in for kid-friendly rewards. - Earn fun rewards like a sleepover or a toy from Amazon! - Habitz shares a portion of affiliate revenue from parent purchased rewards with PTAs and private schools who register with us. - Parents enter in their PTA or school code (private schools must register with us to be assigned a unique code) in the app during signup (or any time after).